Thanks for the news about the finding of a possible part from the plane, Samantha. NEW YORK — Apple said it worked to help investigators find the missing Malaysia Airlines flight 370. At a House Judiciary Committee hearing on Tuesday, Apple’s General Counsel Bruce Sewell responded to a question about the company’s willingness to cooperate with investigations by saying that Apple routinely steps in to serve help enforcement. He pointed to the famous missing plane as an example. “When the Malaysia Airline plane went down, within one hour of that plane being declared missing, we had Apple operators cooperating with telephone providers all over the world, with the airlines and with local law enforcement [and] the FBI to try to find a ping, to try to find some way we could locate where that plane was,” Sewell said. Fugro Discovery arrived back in the search area on 25 February and recommenced underwater search operations. Havila Harmony continues to conduct underwater search operations. Dong Hai Jiu 101 arrived in the search area on 25 February and commenced search operations. Weather may continue to impact on search operations but more favourable conditions are currently being experienced. More than 85,000 square kilometres of the seafloor have been searched so far. Hopefully, it's the correct haystack. I think that the plane can be found and provide answers for all and closure for the families. 240 white balloons floated skyward from a Kuala Lumpur shopping center as families of those on board Malaysian Airlines Flight 370 gathered to mark the two-year anniversary of the Boeing 777's disappearance. There were 227 balloons for the passengers, 12 more for the crew and one for the missing aircraft, each drifted away with "MH370: Always remembered in our hearts," written in black ink. In China, where the tragedy has hit particularly hard, relatives gathered at a temple in Beijing to burn incense and pray. In his statement marking the grim anniversary, Chester, the Australian official, tried to reassure the families. "As we search the remaining 30,000 square-kilometer zone in the days and months ahead, Australia, Malaysia and the People's Republic of China remain hopeful the aircraft will be found," he said. "I assure the family and friends of those on board that their loved ones have not been forgotten and continue to be in our thoughts." "We remain committed to doing everything within our means to solving what is an agonizing mystery for the loved ones of those who were lost," said Malaysia's Prime Minister Najib Razak in a statement. "On this most difficult of days, our thoughts and prayers are with the families of those who will never be forgotten." While the search continues, the plane's location remains a mystery -- as does what exactly caused the crash. Investigators favor the theory that someone altered the plane's course and allowed it to fly until it ran out of fuel, but two years after the Boeing 777 disappeared from radar, that is still just a theory. "We are no closer to understanding what happened and why it happened," said former Chairman of the National Transportation Safety Board, Mark Rosenker, who is now a CBS News aviation safety consultant. "Frankly, we aren't that much closer to preventing one of these from happening again," added Rosenker. "We can do better." Two years after the disappearance of Malaysia Airlines Flight MH370, the UN’s aviation authority has announced new rules that will require planes to transmit their location in real-time in the event of an emergency. The new regulations mandate that aircraft must carry “autonomous distress tracking devices” which will automatically transmit location data from the plane at least once every minute to provide real-time tracking capabilities. According to the International Civil Aviation Organization (ICAO), planes will now also be required to extend the duration of cockpit recordings to 25 hours. “Taken together, these new provisions will ensure that in the case of an accident the location of the site will be known immediately to within six nautical miles, and that investigators will be able to access the aircraft’s flight recorder data promptly and reliably,” said ICAO Council President Dr. Olumuyiwa Benard Aliu in a press release. MALAYSIAN MH370 investigators will return their attention to the crew of the missing Malaysia Airlines plane — one year to the day the 12 men and women were cleared as suspects. The 2nd Interim Statement on MH370, released yesterday on the second anniversary of the plane’s disappearance, identified eight areas under review by the Malaysian ICAO Annex 13 Safety Investigation Team for MH370 including “flight crew profile”. The highly-anticipated publication has been badly received by all who have laid eyes on it because it fails to address key questions relating to radar anomalies and analysis of the flaperon. the only debris confirmed to have come from MH370. It was found on La Reunion last July. Like the 2015 interim report, it sheds no light on what happened to the Boeing 777 and its 239 passengers, which vanished en route from Kuala Lumpur to Beijing on March 8 2014, but does so in three pages instead of several hundred. The newly-stated intention to review the backgrounds of the flight crew does, however, raise suspicions that Malaysia is preparing to divert attention and with it, blame, to Captain Zaharie Shah, 53, and co-pilot Fariq Hamid, 27, if the plane is not found. Investigators found no indications of unusual behaviour among the pilots and cabin crew of Malaysia Airlines Flight 370 before it took off. Havila Harmony suspended underwater search operations due to poor weather conditions and transited north to continue its work where more favourable conditions prevail. Dong Hai Jiu 101 suspended underwater search operations due to poor weather conditions, and will resume operations once safe to do so. Debris, suspected to be from an aircraft, was found in Mozambique. The Governments of Australia, Malaysia, and Mozambique are making arrangements for the debris to be transported to the Australian Transport Safety Bureau laboratories in Canberra. The debris will be examined by investigators from Australia and Malaysia, as well as specialists from Boeing, to confirm if it comes from an aircraft and if so, attempt to establish its origin. In addition, suspected aircraft debris was found on La Réunion. Negotiations are occurring with relevant authorities to arrange for examination of the debris. The Malaysian ICAO Annex 13 Safety Investigation Team released the second interim statement on the progress of the investigation into the disappearance of MH370. Weather may continue to impact on search operations but generally, more favourable conditions are being experienced. More than 90,000 square kilometres of the seafloor have been searched so far. KUALA LUMPUR, Malaysia – Malaysia's transport minister said Monday two plane pieces found in Mozambique will be sent to Australia to verify if they belong to Malaysia Airlines Flight 370. Transport Minister Liow Tiong Lai said a part found recently by an American in Mozambique is now in Malaysia for safekeeping. He said a Malaysian team is expected to return this week from South Africa with another part found by a family holidaying in Mozambique. The family took the piece with them when they returned home to South Africa. Liow said both pieces will be sent to Australia to be examined by an international investigation team. The plane vanished March 8, 2014, with 239 people on board while flying from Kuala Lumpur to Beijing. An object found on the Indian Ocean island of Reunion earlier this month is "unlikely" have come from missing Malaysia Airlines Flight MH370, investigators search for the jet said Wednesday. The 8-by-15-inch piece of ocean debris was found March 3 by Johnny Begue, the beachcomber who last year discovered a barnacle-covered wing fragment that is the only confirmed piece of wreckage from MH370. Begue's discovery came to light at as two other objects were reported to authorities in Mozambique on the east African coast. The Boeing 777 vanished on March 8, 2014 while en route from Kuala Lumpur to Beijing with 239 people on board. Australian authorities leading the hunt confirmed Wednesday that the two objects from Mozambique — a suspected chunk of horizontal stabilizer found in a sandbank Feb. 27 by American Blaine Gibson, and an item bearing serial number '676EB' picked up in December by a South African teen — would be examined by forensic experts. Fugro Equator continues to conduct underwater search operations. The vessel is expected to depart the search area on 17 March, returning to Fremantle for a scheduled resupply visit. Havila Harmony continues to conduct underwater search operations with the AUV. The vessel is expected to depart the search area on 20 March, returning to BAE Henderson. Dong Hai Jiu 101 continues to conduct search operations. A South African citizen reported finding debris, suspected to be from an aircraft, in Mozambique. Arrangements are being made for the debris to be transported to the Australian Transport Safety Bureau laboratories in Canberra, along with the debris that was found in Mozambique by an American citizen last week. Both items will be examined by investigators from Australia and Malaysia, as well as specialists from Boeing, to confirm if they come from an aircraft and establish their origin. Officials from Malaysia are continuing discussions with French authorities about debris found on La Réunion. Current advice is that it is unlikely to be from an aircraft. SYDNEY, Australia — The authorities said Thursday that two pieces of debris found in Mozambique were highly likely to have come from Malaysia Airlines Flight 370, which has been missing for more than two years. A third piece of debris, found in South Africa and bearing part of the logo from the engine maker Rolls-Royce, has yet to be analyzed. Darren Chester, the Australian infrastructure and transport minister, said in a statement that an investigation team from Malaysia had found that both pieces of debris were consistent with panels from a Malaysia Airlines Boeing 777 aircraft. “The analysis has concluded the debris is almost certainly from MH370,” Mr. Chester said. Martin Dolan, a commissioner at Australia’s Transport Safety Bureau, said there were no serial numbers on the two parts. “But we are very certain these are from MH 370,” he said in a telephone interview. This piece, found in South Africa, may be part of a plane engine. Authorities will determine if it belongs to Malaysia Airlines Flight 370, which vanished two years ago. JOHANNESBURG — A South African archaeologist has found a piece of debris with part of an aircraft engine manufacturer’s logo and Malaysia’s transport minister said Tuesday that authorities will examine it to see if it is from the missing Malaysia Airlines Flight 370. “Based on early reports, there is a possibility of the piece originating from an inlet cowling of an aircraft engine,” but a further examination and analysis are needed to verify whether it belongs to Flight 370, said Malaysian Transport Minister Liow Tiong Lai. A team will be dispatched to retrieve the debris, Liow said in a statement. Fugro Equator departed the search area on 17 March, and is en route to Fremantle for a scheduled resupply visit. Havila Harmony departed the search area on 20 March, and is en route to BAE Henderson. Dong Hai Jiu 101 is en route to Fremantle after an incident on the evening of 21 March in which the failure of a tow cable connector resulted in the loss of the SLH-ProSAS-60 towfish. Recovery options are currently being assessed. Two pieces of debris found in Mozambique and suspected to be from an aircraft, arrived in Australia for examination. 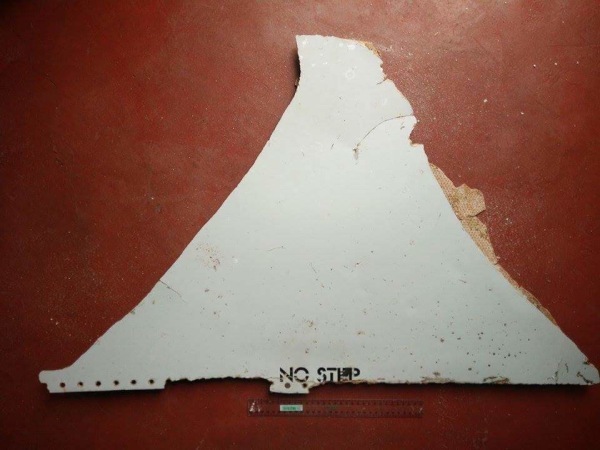 A further piece of possible aircraft debris, suspected to be the cowling from an engine, has been found in South Africa. The Malaysian Government is working with South African officials to arrange for examination of the debris. More than 95,000 square kilometres of the seafloor have been searched so far. Paint and stenciling on debris found in Mozambique matches Boeing 777 parts used by Malaysia Airlines, investigators searching for missing Flight MH370 said Wednesday. Examination and analysis of two parts found on the east African coast was carried out in Australia by international experts, the Australian Transportation Safety Bureau (ATSB) announced in an update. "The dimensions, materials and construction of both parts conform to the specifications of a Boeing 777 aircraft," it said. "The paint and stenciling on both parts match those used by Malaysia Airlines; and as such, both parts are consistent with panels from a Malaysia Airlines Boeing 777 aircraft, and are almost certainly from MH370." Fugro Discovery continues to conduct underwater search operations. The vessel is expected to depart the search area on 1 April, returning to Fremantle for a scheduled resupply visit. Fugro Equator arrived at Fremantle on 23 March and departed the following day after completing resupply operations. Havila Harmony arrived at Fremantle on 26 March, to demobilise the Hugin 4500 Autonomous Underwater Vehicle (AUV) system. The AUV will be stored in Perth for later use; it can be mobilised swiftly if necessary. Dong Hai Jiu 101 is at Fremantle, awaiting the arrival of Phoenix International's Remora III remotely operated vehicle (ROV). The ROV will be deployed in the SLH-ProSAS-60 towfish recovery operations. The examination and analysis on the debris discovered in Mozambique was carried out in Australia by international experts from the Malaysian ICAO Annex 13 Safety Investigation Team for MH370, the ATSB, the Department of Civil Aviation Malaysia and Boeing. The experts were also assisted by specialists from Geoscience Australia and the Australian National University. as such, both parts are consistent with panels from a Malaysia Airlines Boeing 777 aircraft, and are almost certainly from MH370. Weather may continue to impact on search operations but generally more favourable conditions are being experienced.